It took four years, but there is finally movement in the right direction for Florida’s public school annual science assessments. It’s not much and it doesn’t prove anything (we’ll need to see positive results for multiple consecutive years before we break out the confetti and noisemakers), but it’s a start. 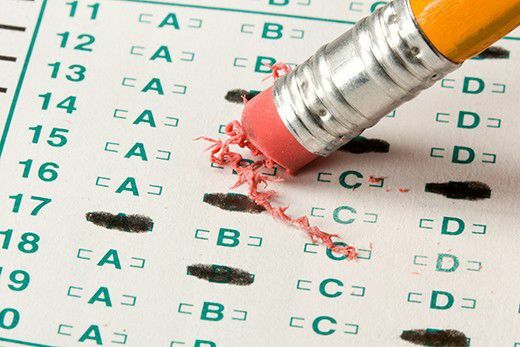 There are three science exams that public school students in Florida must take: the statewide science assessments in grades 5 and 8 and the high school biology end of course exam. Students have to score a level three or higher on the five point scale to pass. (See all the score reports at the DOE Assessments report page.) The 5th and 8th grade tests cover a variety of science topics, such as the nature of science, earth/space science, physical science and life science. The biology test is the only mandatory statewide science assessment given in high school. As I point out nearly every year, flip these numbers to get the real story. Instead of 50 percent passing the 8th grade test, reflect on the fact that 50 percent are not passing it. Why are the 5th graders consistently outperforming the 8th graders year after year? (*)FDOE started a few years ago combining the 8th grade science assessment results with the results of 8th graders who instead took the Biology EOC. The combined statistic reported on most of the FDOE’s documents this year is 52 percent passing in 8th grade. But the pure Statewide Science Assessment – without including 8th grade biology results – has a passing percentage of only 50. I highlighted and questioned this data sleight of hand when I first noticed it a couple of years ago: DOE: Just fudge the results; no one cares about science anyway. This year a new question occurred to me. It looks like the biology EOC report, which breaks down the performance of the various grade levels of students who took the test, includes 8th graders. Is the DOE using 8th graders’ biology scores twice in their statistics: once in the biology report and again in the 8th grade science assessment results? Why? Out of 10,147 8th graders who took the EOC, 90 percent passed with a level 3 or above. Out of 85,877 9th graders who took the EOC, 81 percent passed with a level 3 or above. But the older the students get, the worse they do. Out of 82,366 10th graders, 51 percent passed. Out of 12,242 11th graders, 38 percent passed. Out of 2,133 12 graders, 33 percent passed. This could be worth more analysis. The stark difference between the performance of 9th graders and 10th graders is concerning. What’s the reason for this? Keep in mind these statistics are for students taking the test for the first time, not those retaking the test. I welcome you to see my write-ups about previous years’ results at our Issues Page. In my district the 8th graders who take Bio are gifted. The other 9th graders who aren’t “eligible” to take Bio are shuffled into either Physical Sci or Env Sci depending on their reading skills (don’t even get me started on why we’re using Env Sci as a pre requisite for Bio. I argues strongly against this decision). So the kids who take Bio in later grades, generally, have poorer reading skills, hence the lower pass rates. I concur with your analysis. My district changed the sequence to teach Bio I in 9th grade for all students a few years ago (teachers said don’t do it but what do we know) and students struggled ever after. We just moved Bio I back to 10th grade where it should have remained. The district also decided to replace 9th grade physical science (the less challenging qualitative version of PS) with environmental science to allow us to essentially stretch Bio I out to two years. As reading levels have plummeted students are less and less capable of handling the amount of content in Bio I. Mark Twain referred to lies, damn lies, and statistics. My district is crowing about getting the highest Biology EOC scores in the state while conveniently failing to mention that the only students who took the test this year were Honors and Pre-International Baccalaureate tracked students because we were transitioning back to teaching Bio I in tenth grade. There were no Bio I average classes. I no longer have access to our school test data but for the 2017 Biology EOC a score of 12/56 on Form A was passing. 2016 wasn’t much better. Random guessing would have earned a 14. DOE is setting the bar awful low.